Lewis is an outwardly ordinary guy, but in reality he is hiding an obsession - revenge - against Cathy. Lewis kidnaps Cathy in broad daylight and takes her to his home, where he locks her in a soundproof cell and attempts to extract a dark secret from her past. My name is Cathy Noland. One thing is certain. “10X10” breaks all records when speaking of resurrections. The number of times you see one of the two protagonists getting back on their feet again seemed endless. It looked like a newer version of “Night of the living dead“. But this time with two stubborn non-zombies playing in it, whose resilience seemed superhuman. At one point I was more concerned with figuring out which of the two had the lowest IQ. Because you can’t keep up with the number of stupidities after a while. And finally, I also wondered at the end what statement Lewis (Luke Evans) would give about the whole event when the police show up on his driveway. It’s clear I didn’t really like this film. And that because of the accumulation of absurdities. I wanted to see this movie solely because of Luke Evans appearing in it. Personally, I don’t think he’s a bad actor. He has a certain likable appearance. In my opinion, he didn’t act so bad in “No one lives” and “Message from the king“. He radiates a calmness and coolness. But here he also seems to have the gift of stupidity. Or they tried to portray him as a real amateur. However, it all starts fairly intriguing. The patience with which Luke observes his future victim Cathy (Kelly Reilly) and the seemingly perfect way in which he carries out the abduction. From then on it started to look more like a slapstick than a nerve-racking thriller. The abduction wasn’t perfect, but rather a combination of coincidences and pure luck. But for all we know, he could have been caught red-handed and taken into custody. On the other hand, would that be the case, this would have been a short movie. Speaking of luck-pushing. Before you know it, someone is being kidnapped. The next hilarious moment (intentionally I suppose) is the arrival at his hypermodern, tastefully decorated house. There the victim awaits an ingenious installed, low-noise isolation cell of 10 by 10 meters. Luke turns out to be a regular do-it-yourself shopper because he made it all by himself. He did manage to do that. But apparently, a perfectly functioning garage door was a bit too much. And from then on a psychological cat and mouse game starts that only revolves around revenge. It’s best I don’t tell more specifics of this less successful film. Contentwise, it’s already nothing much. Let alone I’d reveal more. Actually, the content is so limited that they decided to fill it up with irrelevant trivialities and artificial emotional moments. You have to admit that the creators of this film ensured that the pace is high. Only half an hour has passed and poor Cathy is already gagged and screaming anxiously in her cell. 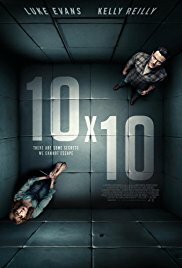 The fact that “10X10” didn’t meet my expectations is, in my opinion, not due to the acting itself. That wasn’t so bad. It was even reasonably convincing at times. I think that the script is the cause of this disappointment. And this because of a too limited story. How can you make a whopper of a film from a wafer-thin, simplistic plot? Even the Spielberg’s and George Lucas’s wouldn’t figure out how to do that. To be honest, it didn’t matter to me anymore who would die in the end. I was already satisfied that at least an acceptable playing time had been provided.